WILLEMSTAD – The political leader of the MFK and former Prime Minister of Curaçao Gerrit Schott just announced that he is willing to step aside as Member of Parliament if he’s the cause that his party was not approached to form a new government. According to Schotte, his party was not even approached to talk or to be informed about a possibility of being part of a new government. “If I’m the cause of this, then I will step aside so my party can be part of the negotiations,” said Schotte. “The people have voted for MFK to be in in the government. I am the biggest vote getter of the island. The people want us in the government,” said Schotte during the party’s press conference. According to Schotte, MAN and MFK were part of the opposition and together they have the majority of the votes. The people have expressed themselves in the elections and they want a left-leaning coalition, a more social government, said Schotte. “The people have rejected the current government formed by Pueblo Soberano, PNP and PAR. 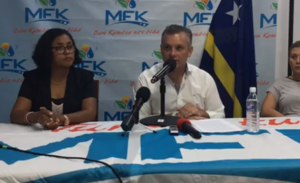 MAN and MFK should form a coalition together,” said Schotte. Schotte also indicated that if his proposal is rejected by the leading party MAN, he will continue as a member of the opposition in the next four years. Schotte was convicted of fraud, money laundering, corruption, and forgery by the Court of First Instance. He has appealed his case and hired lawyers from the Netherlands to defend him.